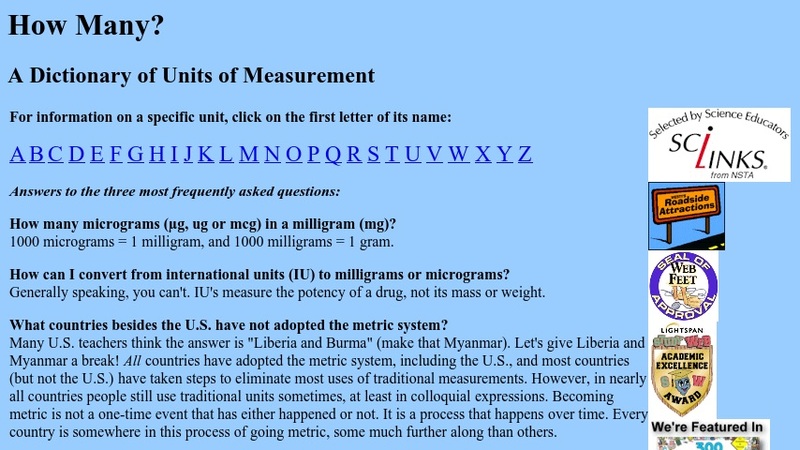 A Dictionary of Units of Measurement was written by Russ Rowlett, the Director of the Center for Mathematics and Science Education at the University of North Carolina at Chapel Hill. This Web site provides information on everything from the Metric System to Viscosity Grades and many other measurement units in between. A simple but very useful site, visitors can find answers to their basic unit measurement questions or just have fun learning about some of the common and somewhat obscure ways we measure things.